Product description: Paper Wedding, Best-Friend Bride is written by Sheri whitefeather and published by Mills & boon. Buy Paper Wedding, Best-Friend Bride by Sheri whitefeather from markmybook.com. An online bokstore for all kind of fiction, non fiction books and novels of English, Hindi & other Indian Languages. Sheri WhiteFeather is an award-winning, national bestselling author. Her novels are generously spiced with love and passion. She has also written under the name Cherie Feather. She enjoys traveling and going to art galleries, libraries and museums. 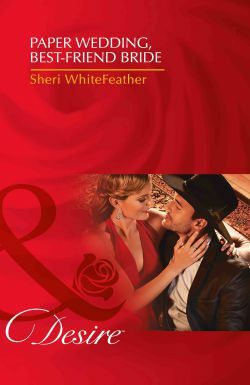 Visit her website at www.sheriwhitefeather.com where you can enter her contest and find links to her Facebook and Twitter pages. She loves connecting with readers. To adopt a child best friends conveniently tie the knot. But will they inconveniently fall in love? Since they were young tech mogul Max Marquez and socialite Lizzie McQueen have always agreed on one thing theyre just friends But fate has thrown them a curveball in the form of a lovable orphan who needs a good home. To adopt the little boy they must marry. And to marry they must face the unthinkable sharing a bedroom Will they discover that their friendship is a facade for a deeper attraction long denied causing their arrangement to spin right off its axis?